With the 2018 edition of the Mae Young Classic having kicked off, we’re celebrating these extraordinary women of sports-entertainment with Mae Young Classic Week here on Superstar Savepoint! Returning to the Mae Young Classic for the second time, MIA YIM makes her UpUpDownDown debut on Superstar Sav-… wait, THE SHELTON SHOW?! The VG OG a.k.a. Shelton Benjamin kicks out our host Austin Creed to take on his long-standing rival (a.k.a. BFF) in the finale of our Mae Young Classic Week on UpUpDownDown! Mia Yim recently did an interview with Huff Post to discuss the anniversary since spoke out about her domestic abuse experience and more. Read the full article below. Mia never imagined that just one year after sharing and reliving some of her most difficult moments with domestic violence, she would go on to achieve a childhood dream that often felt unattainable: wrestling for the WWE. Mia is scheduled to take part in the WWE Mae Young Classic, a first-ever all-women’s tournament, airing Aug. 28th at 9/8C on the WWE Network. 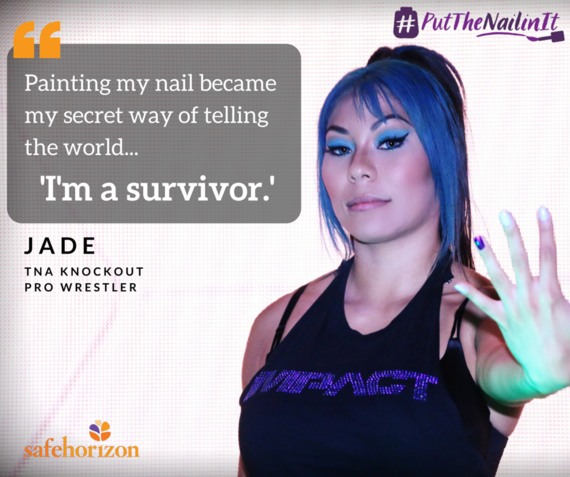 In her entrance, she has incorporated the purple nail—a reminder not only that she survived, but that she fights for domestic violence survivors everywhere. BRIAN: YOU DISPROVE THE STEREOTYPE THAT VICTIMS ARE “WEAK.” YOU ARE AN INCREDIBLY STRONG PERSON — PHYSICALLY, MENTALLY, AND EMOTIONALLY– WHO HAD AN ABUSIVE PARTNER. WHAT WOULD YOU SAY TO SOMEONE IN AN ABUSIVE RELATIONSHIP, WHO ISN’T FEELING SO STRONG? Mia Yim: After the abuse, I was timid. I was always walking on eggshells and didn’t want to act the wrong way. But the #PutTheNailinIt campaign gave me the strength I needed to speak out. Now, I don’t care what others think of me. I just want to help others. I’m driven and I can see my dream in arm’s reach. I am going to grab it no matter what happens. For the first time, meet the 32 competitors from around the globe who are participating in this summer’s historic WWE Mae Young Classic.